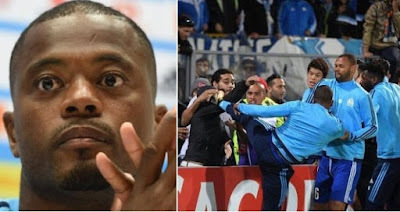 Former Manchester United Left full back, Patrice Evra‘s contract has been terminated by Olympique de Marseille after he was banned until June 2018 for kung-fu kicking a fan. 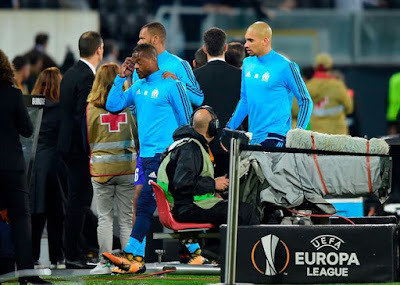 The former France captain was sent off before Marseille’s Europa League defeat against Vitoria on November 2 after lashing out at a supporter who Evra claimed was abusing him. UEFA charged Evra under article 15 of their disciplinary regulations, which deals with the misconduct of players, banning him from their club competitions until June. And Marseille quickly followed news of his suspension by terminating his contract with immediate effect. “Patrice Evra has been exemplary on the field and in the locker room. He played an important role in reviving the team and in the improvement of results. “However, on November 2 in Guimaraes he committed an irreparable act by responding to provocations from a handful of individuals. “Nothing justified such a reaction, especially from a senior player whose attitude both on and off the pitch should inspire the youngest of us. “In that context, the conditions were no longer right for Patrice Evra to accomplish his mission here with serenity or, above all, effectively. “Both parties agreed to end the collaboration by mutual consent. “This incident also highlighted the unacceptable attitude of a small number of people who uttered insults and threats of violence towards the player and his family before contemptuously invading the pitch. Club president Jacques-Henri Eyraud added: “Today, there is sadness. 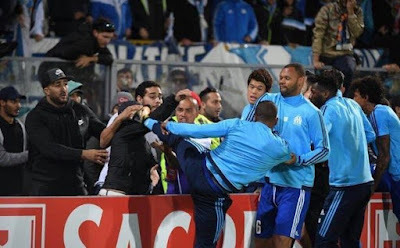 For Patrice Evra first, who obviously understood all the consequences of his action and who will no longer be able to exercise his passion at Olympique de Marseille. Marseille have also been fined €25,000 by UEFA for their supporters invading the pitch, setting off fireworks and acts of damage.